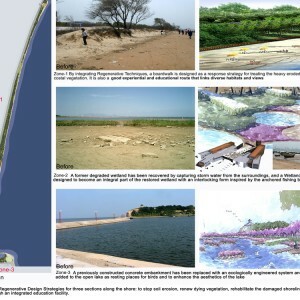 Turenscape: Using various Regenerative Design techniques, a heavily eroded, badly abused and decaying beach has been ecologically recovered and successfully transformed into an aethestically pleasing and well visited place, demonstrating landscape architects can professionally facilitate the initiatives of rebuilding a harmonious relationship between man and nature through ecological design. 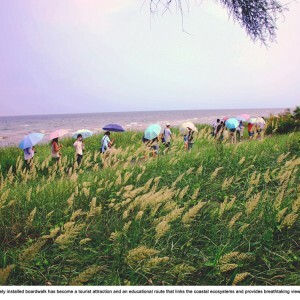 The beach is located along the Bohai Sea shoreline of Qinhuangdao city, a touristic coastal city in North China’s Hebei Province, 6.4 kilometers in length and an area of 60 hectares. 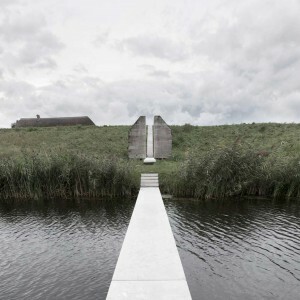 The whole site was in an environmentally and ecologically damaged condition. 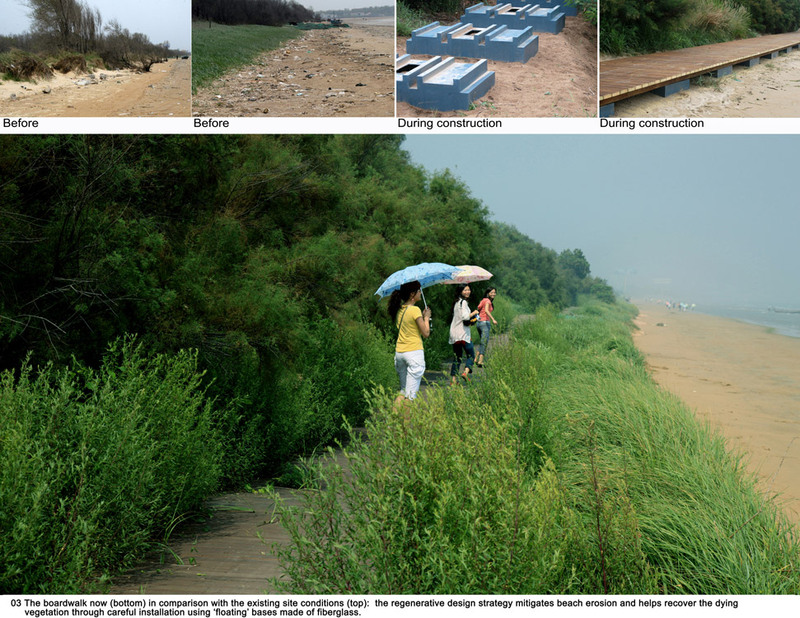 The costal sand dunes were heavy eroded, the costal vegetation was decaying and the beach was deserted and littered; Prior unwise development had destroyed the costal wetland and left it full of debris. 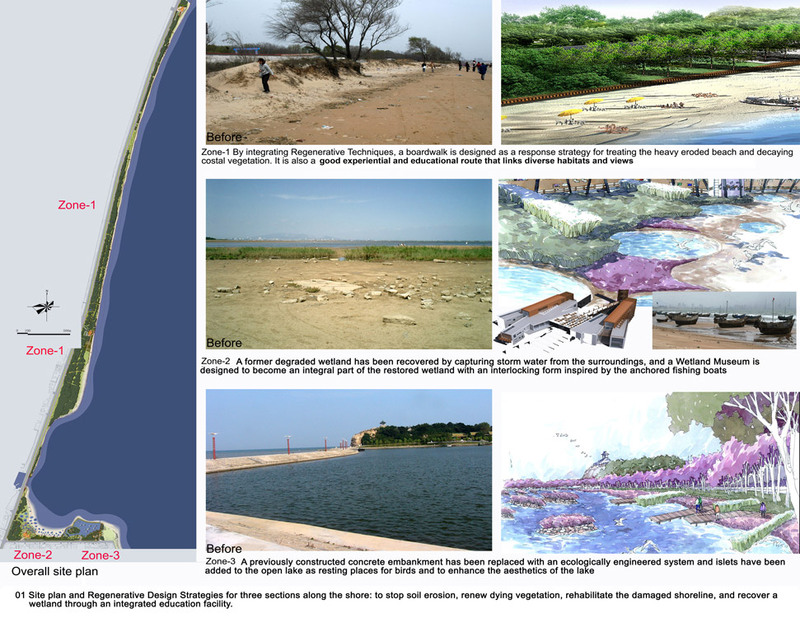 The intention of this project is to rehabilitate the damaged natural environment, restore and unveil to tourists and local residents the beauty of the site while transforming a former degraded beach into an ecologically healthy and aesthetically attractive landscape. 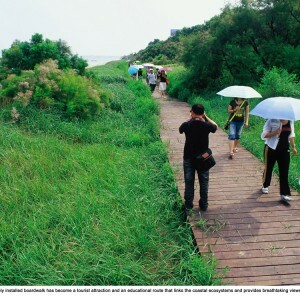 This is basically a windy shoreline about 5 kilometers long, covered with coastal sand dunes and diverse plant communities which have adapted themselves to various site conditions; they include: wetland communities of cattail (Typha angustifolia), sand dunes grass communities, Amorpha shrub (Amorpha fruiticosa), Chinese Tamarisk (Tamarix chinensis) groves, forests of Black Locust (Robinia pseudoacacia). and willow (Salix matsudana). For a long time, this shore line had been deserted, heavily eroded and littered, and almost inaccessible to tourists and local residents. 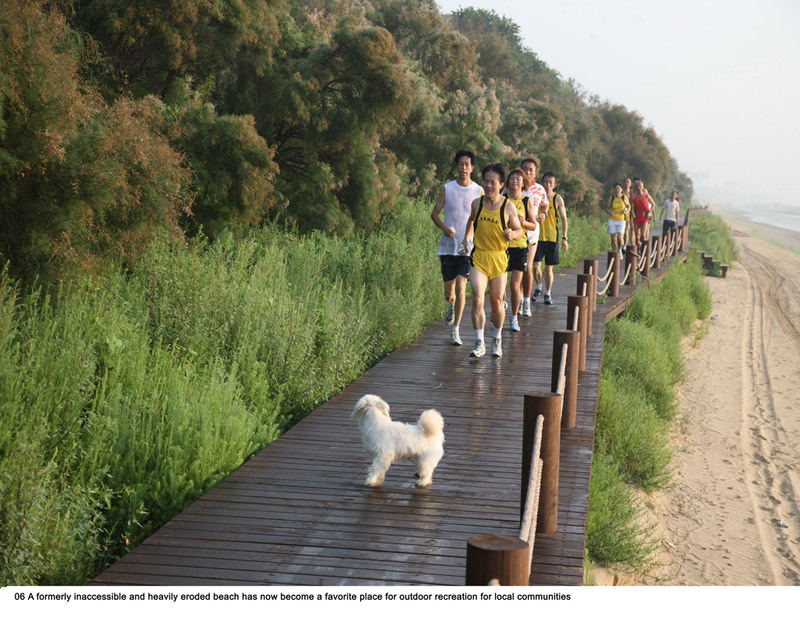 The design solution has carefully arranged a boardwalk that winds along the shoreline, linking different patches of plant communities. 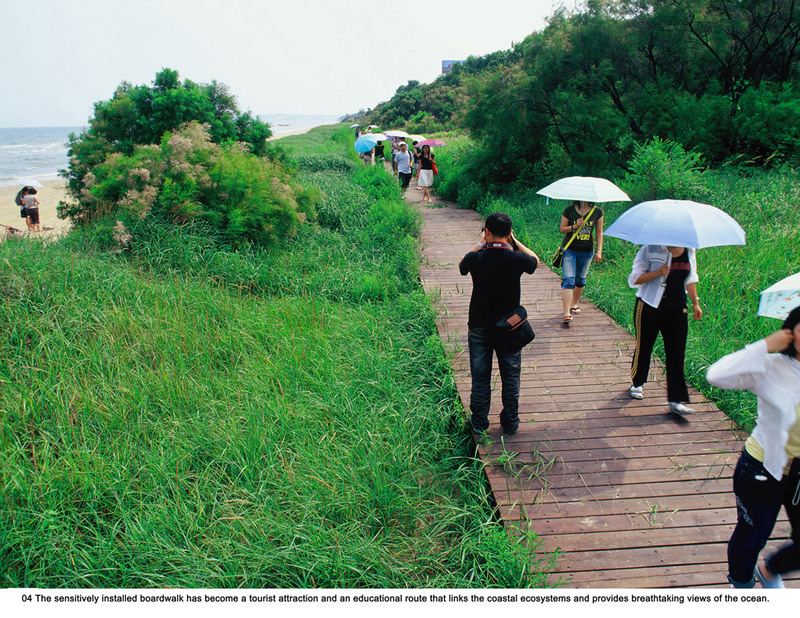 This boardwalk not only allows visitors to experience the different plant communities on the way, but also acts as a soil conservation installation that protects the shoreline from the erosion caused by the ocean wind and weave. 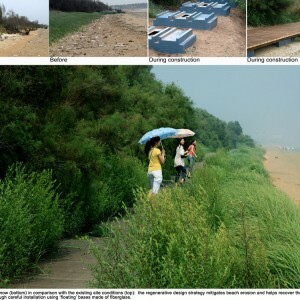 Eco-friendly bases are designed using fiberglass that allows the boardwalk to “float” above the sand dunes and wetland. 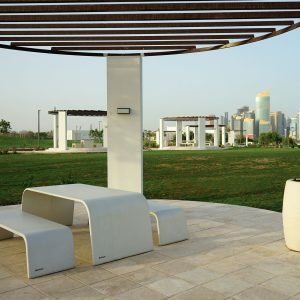 The fiberglass bases are specially prefabricated containers that can be filled with sand or be empty depending on the soil conditions. 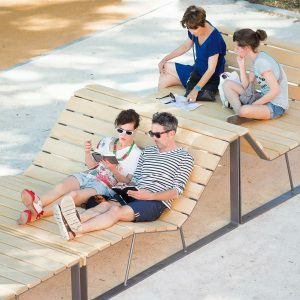 This innovative and now patented (by the landscape architect) techniques not only makes the process of boardwalk installation much easier in a natural environment than the conventional construction approach, which could be a harder task, but also make minimum impact to the environment. 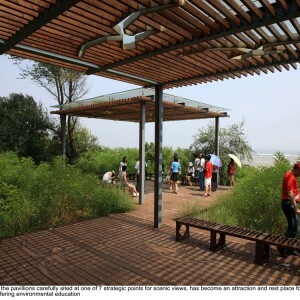 Resting pavilions, shading structures and environmental interpretation systems are designed along the boardwalk that are carefully sited for the scenery, allowing to visualize the ecological meaning of the site and highlighting their panoramic beauty. 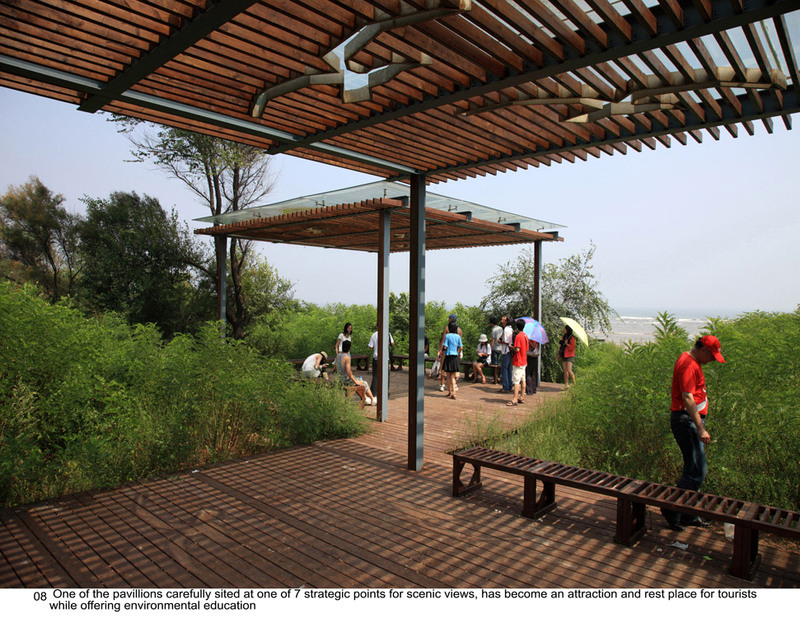 These pavilions become attractive focal points for tourists and the local residents who come in groups to enjoy the landscape and recreate. 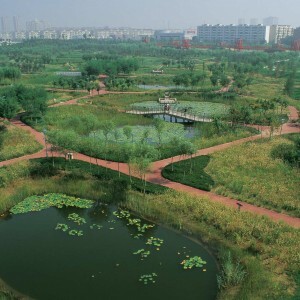 The central zone is where the new bird museum is built. 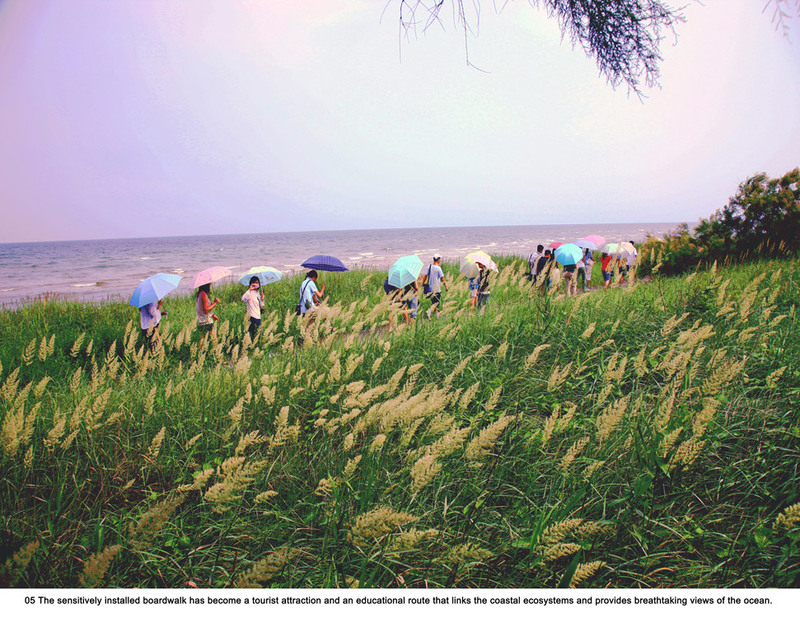 It was a degraded coastal wetland as well, adjacent to an intertidal zone that had been listed as a national bird reserve. 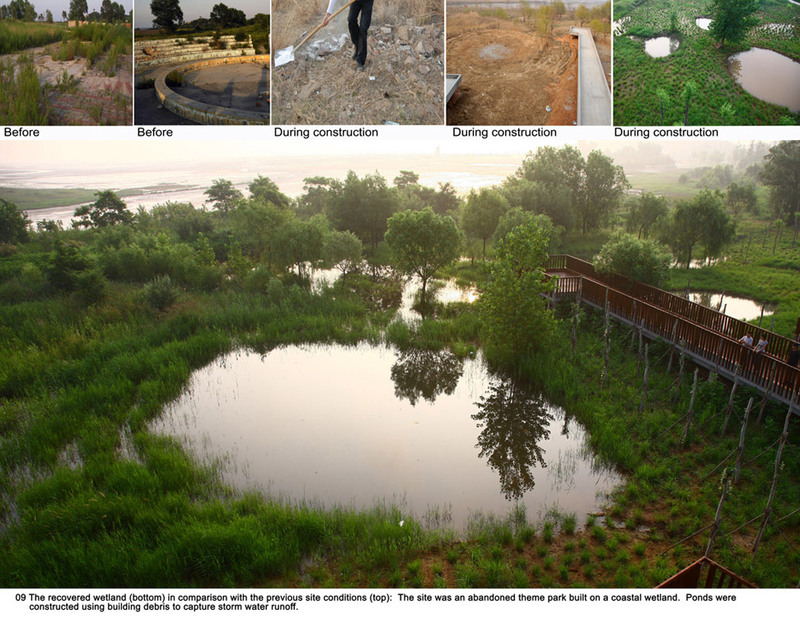 This site was an abandoned construction from a former theme park, which destroyed the coastal wetland habitats when built. 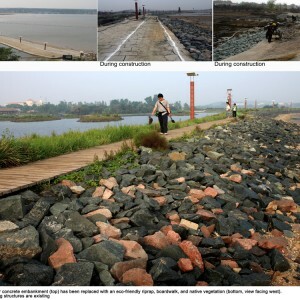 The site was also covered with building debris and garbage. 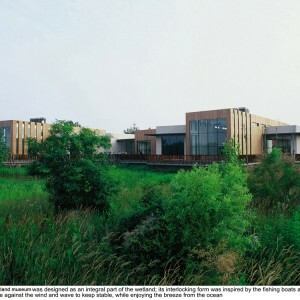 Ecological recovery was a strong need, so the landscape architect searched for an idea which could be natural, social and economically sustainable: A Wetland Museum was built on this site as an education facility in association with the bird reserve beyond. 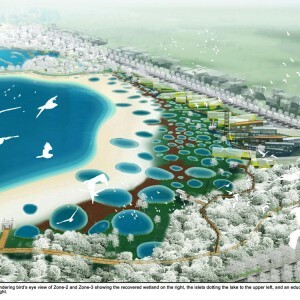 Inspired by the bubble-patterned water sinks along the intertidal zone, water holes are created in among the building debris to catch the rain water from the land that allow wetland plant and animal communities to get established, also attracting birds to forage. 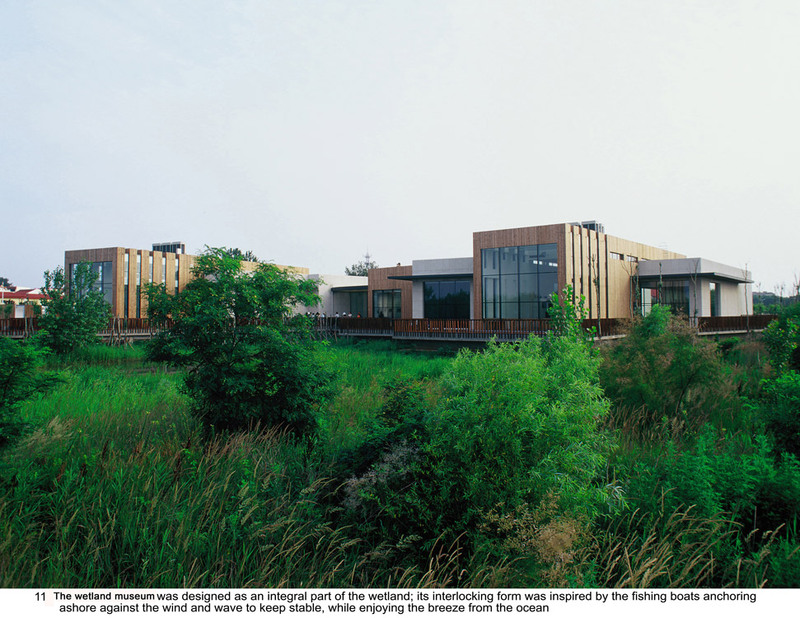 The Wetland Museum is designed as an integral part of the landscape, stretching into the wetland, and inlets breeze from the ocean to cool off the hot summer and reduce the use of energy in the building. 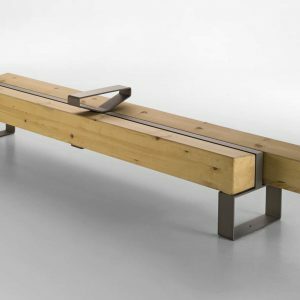 The interlocking pattern of the building and its environment was inspired by the local fishing boats anchoring in group off the shore, in an image against the wind and waves that keep the boats stable in the water. 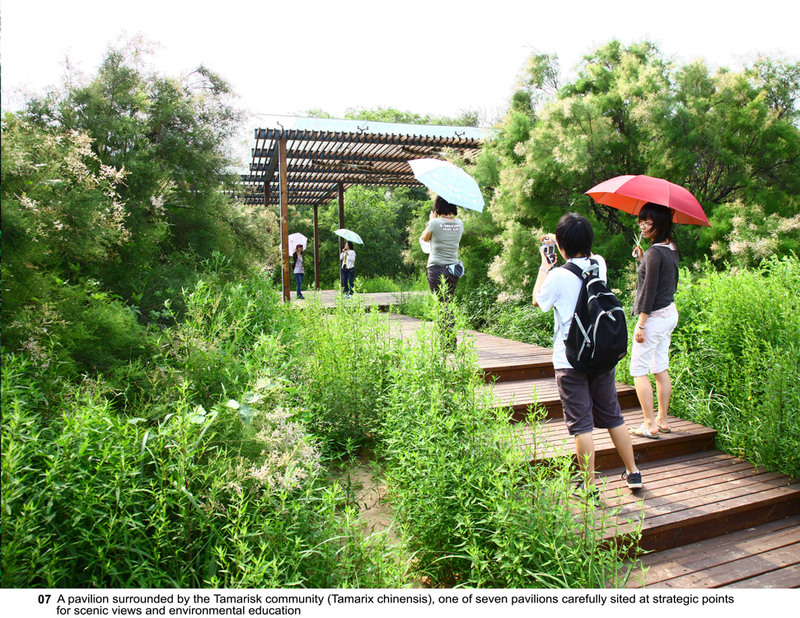 A system of board walk and platform is built allowing people to walk from the building into the wetland and enjoy the newly created habitats and diverse species. 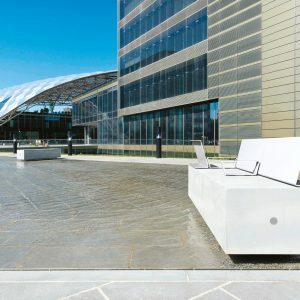 This zone is at the very east end of the project. 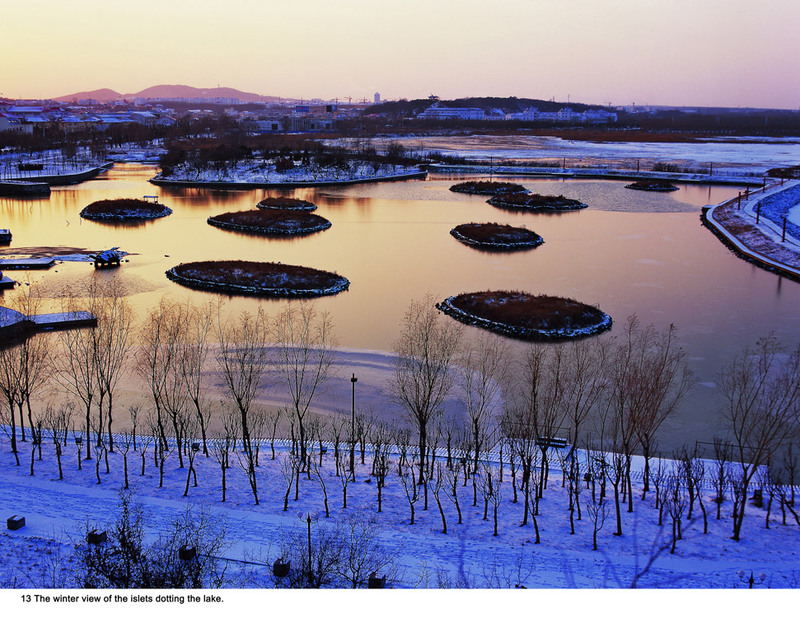 It was previously a park constituted by a heavy concrete embankment which was built to protect the shoreline from erosion and to create a lake by trapping the sea water during the high tide. 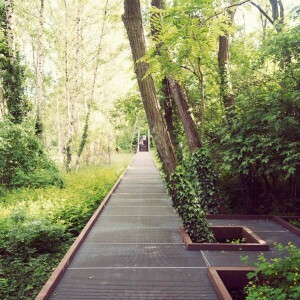 This park was certainly not satisfying, neither in ecological or aesthetical terms. 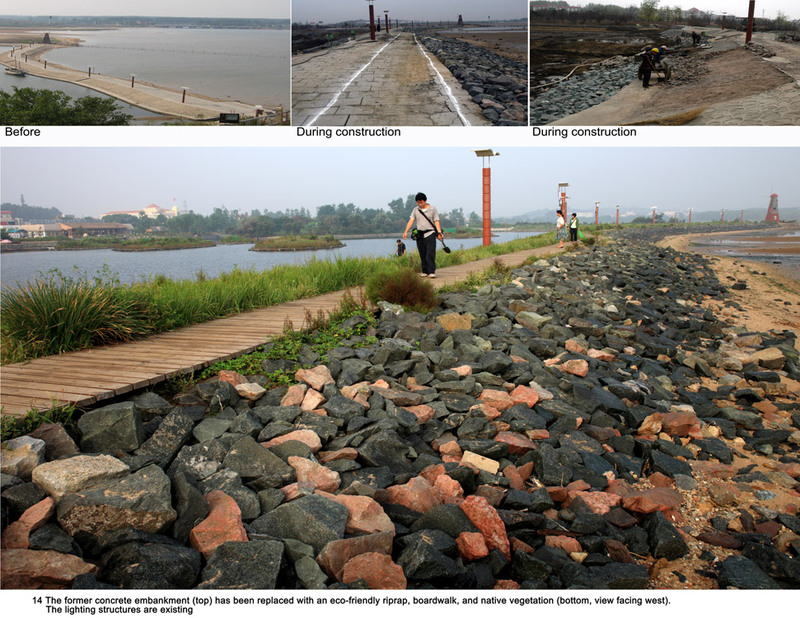 The concrete embankment was boring and barren and the Lake was empty and bounded by rigid concrete shoreline. 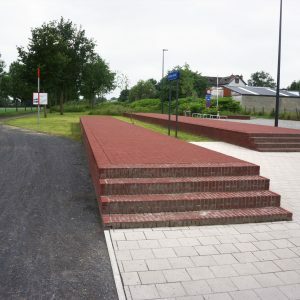 The Regenerative Design strategies include demolishing the concrete and replacing it with ecologically friendly rip-rap. 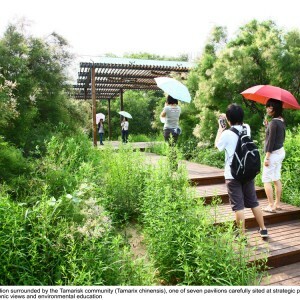 A boardwalk is built to replace the hard pavement, and native ground cover is introduced to green the surface alongside the board walk. 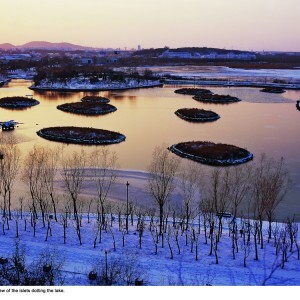 In addition, 9 green islets are created in the middle of the lake to enrich the empty and boring water surface allowing birds to rest and nest. 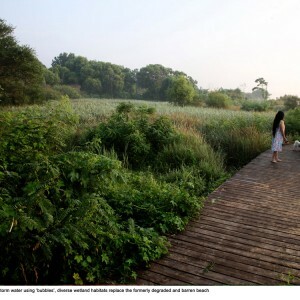 The results of these ecological restoring designs are remarkably successful. 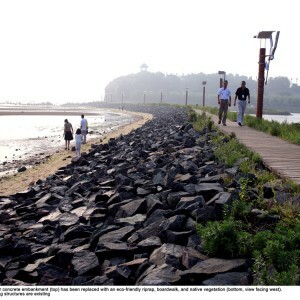 The erosion of the shoreline has been effectively controlled, the degraded costal wetland has been restored successfully, the boring and ecologically dead concrete embankment has been ecologically rehabilitated; A continuous boardwalk links various coastal plant communities, giving tourists an unforgettable educational and aesthetic experience; the bird museum becomes an integral part of the coastal landscape that breaths with the ocean and acts as a focal point along the linear ecological and scenic beach. 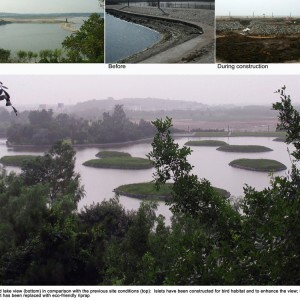 This project demonstrates how landscape architects can incorporate ecology, engineering, innovative technique and design elements into an effective regenerative operation on a damaged landscape, and transform the degraded man-nature relationship into a sustainable and harmonious one. 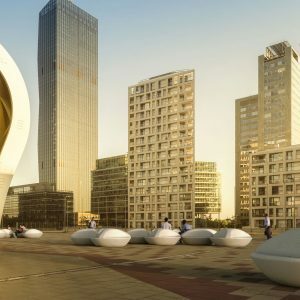 The design is somehow overdone to the site and not exciting enough.They are very good at ecology but simply this approach is applied everywhere in different projects without enough consideration of the place’s the specific characters. 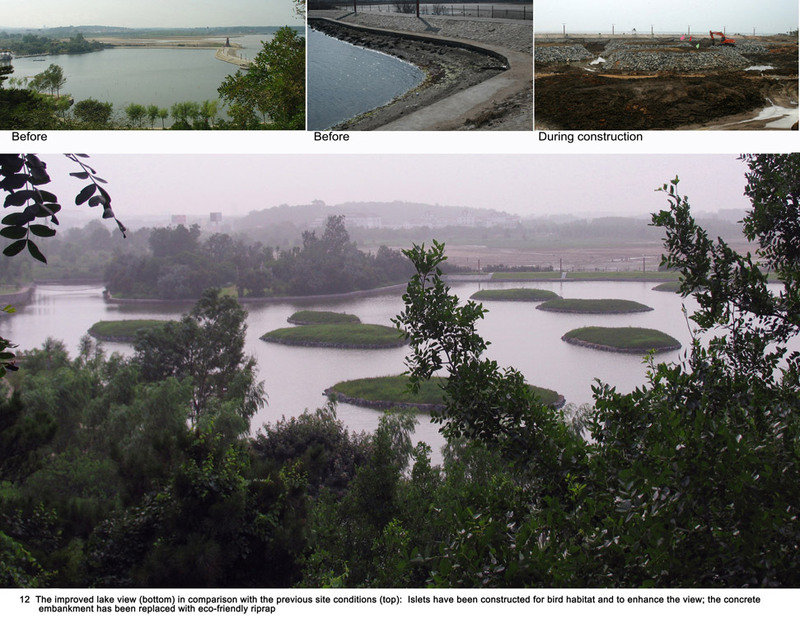 in the third picture, where a before-after comparison of the wetland ponds is shown, i wan wondering if anyone could explain to me, are debris used just to form the landscape so it holds the water, or maybe the materials of debris prevent water shipping underground?? ?like clay or sand that prevent absorption of water?? 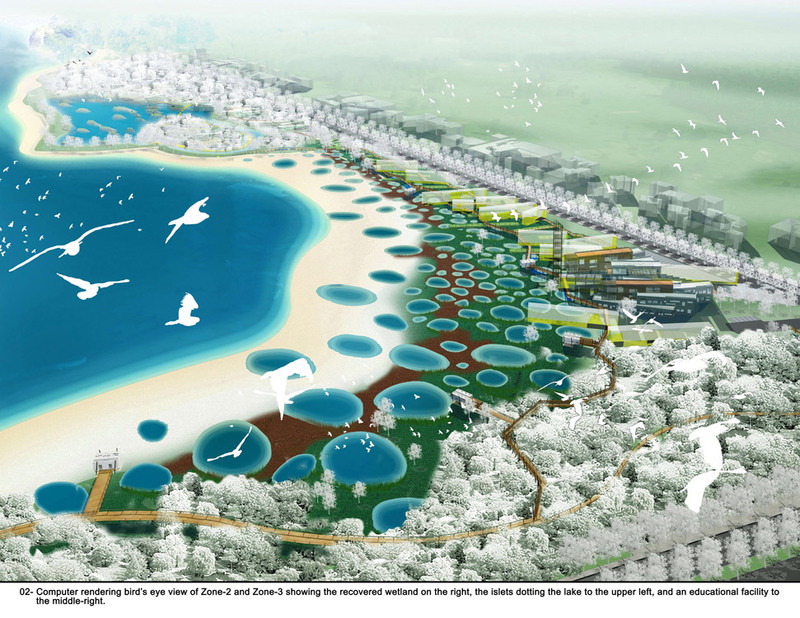 Not very ecological if you ask me… creating artificial human shaped islands? 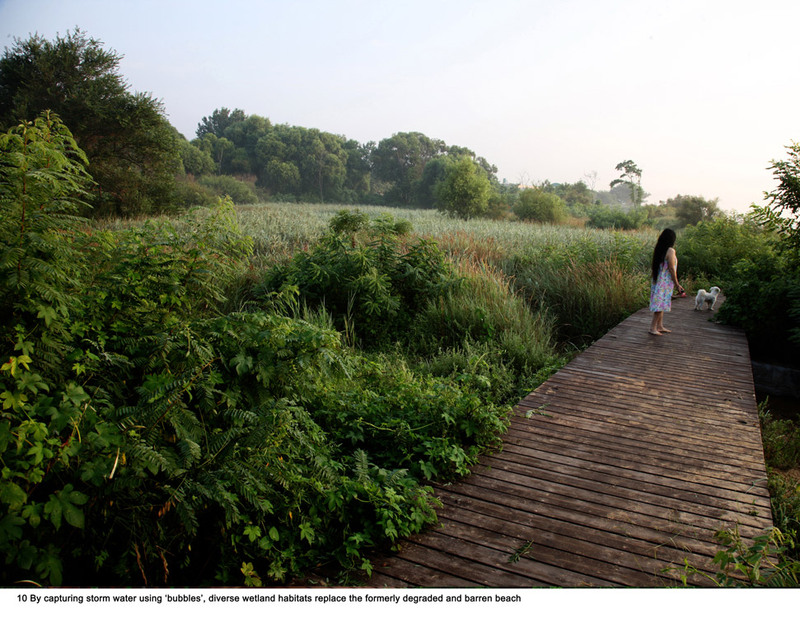 I’d say lots of human interference, trying to make the ‘wetlands’ look beautiful to human eye – is not so much about ecology. 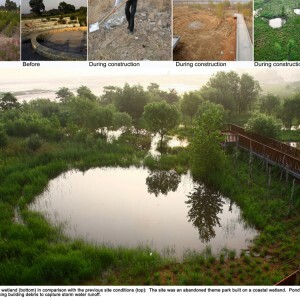 Maybe the meaning of ecology is misunderstood by the Chinese landscape architects??? 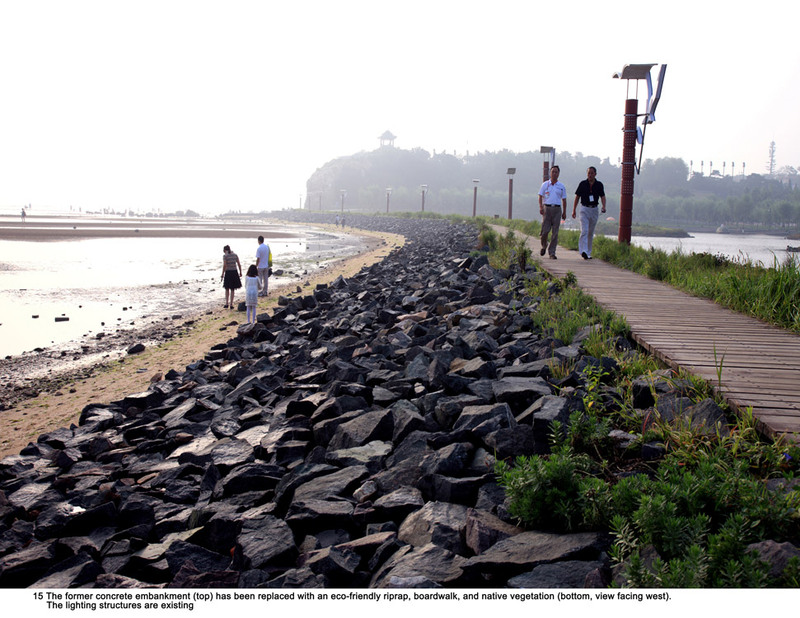 I’ve spent a lot of time birding at Beidaihe; some of best habitats are what you folks might term degraded! 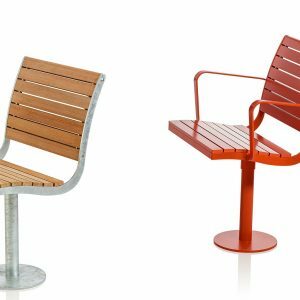 To me, the designs look hideous, and utterly unecological; sterile even. Too bad the project did not employ someone who knew about birds and the natural world.